Navigate to the Landing Lage Editor of your campaign. Select the landing page of which you would like to get the web links and or QR code for. From the page properties tab, expand the Web Linkssection. There are multiple sets or web link&apos;s and QR codes to choose from. Click the plus button to expand each set and access their web links and QR codes. You can add more sets or URL&apos;s from your settings. Iframe Script - This script allows you to host this Mobit landing page within an existing webpage. Please note, this script will not include any adaptive background features as this is outside of the iFrame content. Mbitly URL -This shortened URL can be used in communications such as Emails (non Infusionsoft Users) and Facebook posts for sending visitors to your Mobit Landing Page.NOTE: It is important that this link is not used within your MOBIT campaign builder or landing page editori.e. for Go to URL actions and URL&apos;s (for buttons and images), as a contact will NOT be tracked through to the new landing page. For this, the Page Link URL should be used. Page Link URL - This long URL should always be used within the campaign builder and landing page editori.e. for Go to URL actions and URL&apos;s (for buttons and images), as a contact will be tracked through to the new landing page. Infusionsoft Email URL (only appears in Infusionsoft synced accounts) -This URL should always be used when linking to a MOBIT landing page from an Infusionsoft email. 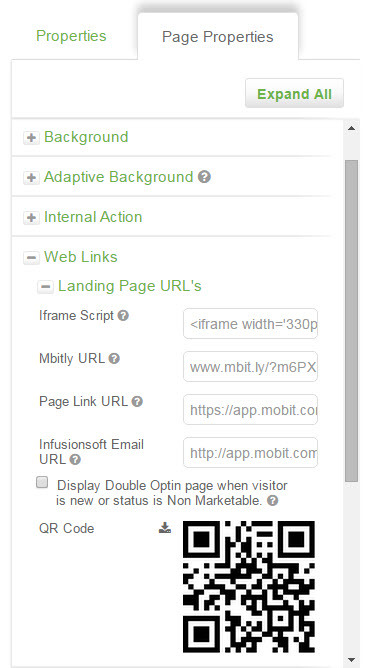 It allows you to track a contact from an Infusionsoft email through to your MOBIT landing page. As a result, any forms and merge fields on your landing page will be populated with their contact information and any marketing automation set up in your MOBIT campaign builder will be performed on that contact. You may ask why there are multiple sets of landing page URL&apos;s beyond landing page URL&apos;s, and why you have the ability to add more sets of landing page URL&apos;s from your settings. These URL&apos;s allow you to track the origin of new contacts that are created as a result of form submissions on your landing page. For example,if you want to link to your MOBIT landing page in a facebook post, twitter post, and an email (non Infusionsoft). you would use 3 different sets of landing page URL&apos;s see exactly where any new contacts came from.